I've never been into Mountain Biking. I'm usually either doing BMX or just riding MX. Ah here we go, mace! Haven't seen Seasons, but I own F1rst. I also have A LOT of other ones, like The Collective, ROAM, NWD 1-8, Between The Tape, Earthed 1-5, Free Delivery, Kranked 1-6, etc. And yeah, the heli cams are gettin kinda gay..they should only be used for ski/snowboard vids. It's a link to one of my biking albums on Facebook..If you have one, add me if you can't see them. If not, I'll make a PictureTrail album or something for you. I'll post some pics of me and my team at the US Open a few weeks ago. Takes place at Diablo (Mtn. Creek) in NJ, by me. 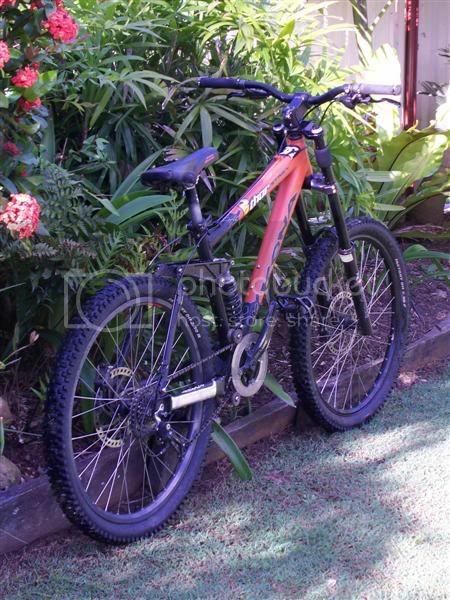 heres my downhill bike .. got it for a carton haha .... no pics on it yet but. can we make this thread pushys in general so we can include bmx ?